A computer with a Genymotion virtual machine and a Kali virtual machine. I did this on a Mac, but the steps should be similar for Linux hosts. I don't recommend trying this on Windows. The networking leads to problems. To configure your system so the Android Debug Bridge in Kali can access your Genymotion virtual machine. Start your VMware Kali virtual machine and connect to the Internet. Find your IP address, as highlighted in the image below. On your host system, open a Terminal or Command Prompt. 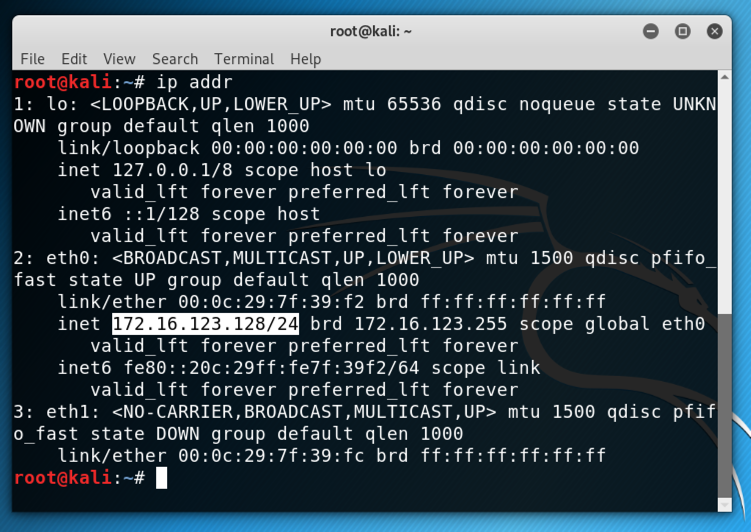 Find the adapter with an IP address on the same subnet as your Kali machine. 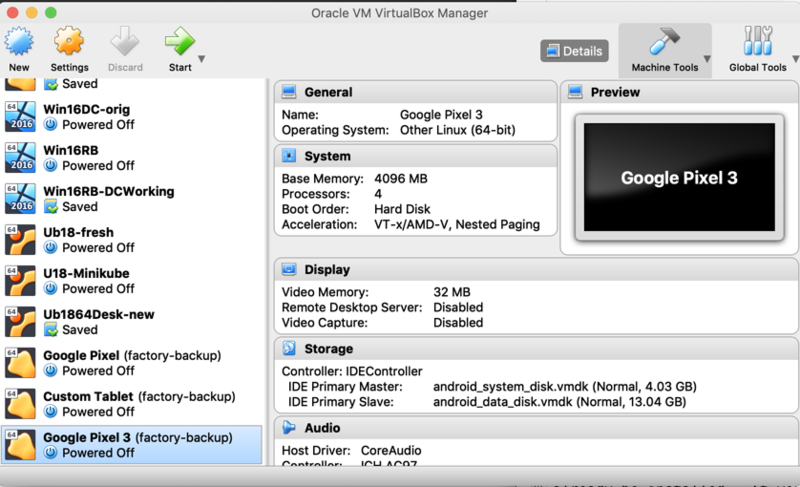 On my system, it was vmnet8, as highlighted in the image below. If your Genymotion virtual Android phone is running, close it. In VirtualBox, click to select your "Google Pixel 3" device, as shown below. Click Settings. 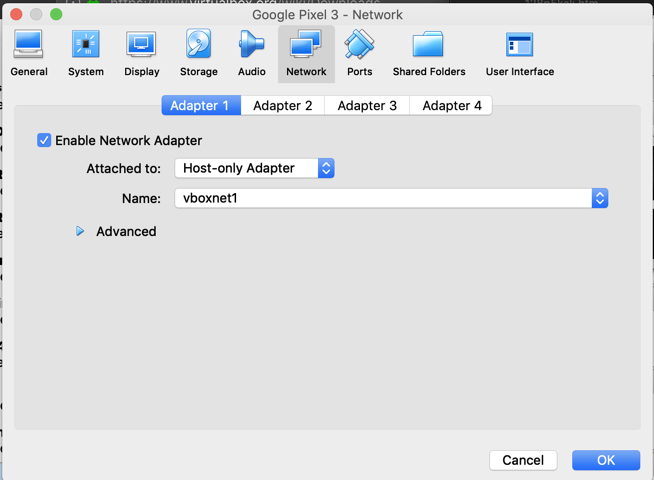 On the Network tab, the first Adapter is set to "Host-only", as shown below. Don't change anything here--this adapter is reuired for Genymotion. Click the "Adapter 2" tab. 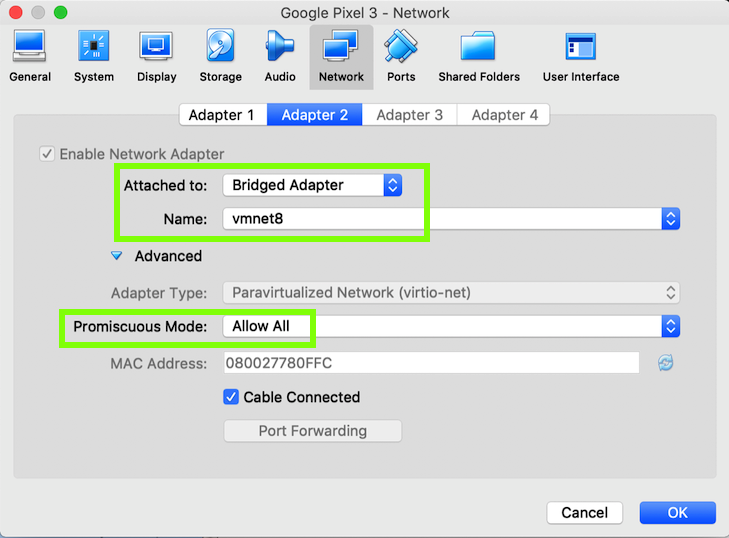 Set this adapter to Bridged and connect it to the host adapter Kali is using, as shown below. Click Advanced and allow "Promiscuous Mode", as shown below. After this networking adjustment, you must always start VMware before Genymotion. Otherwise Genymotion will give an error and tell you to open Virtualbox to adjust the networking. Start your Genymotion Android device. In Settings, click "Network & internet". In the "Network details" screen, at the top right, click the Pencil icon. In the "Proxy" field, click the down-arrow. Find your IP address, as shown below. It should be on the same subnet as Kali. Make a note of it--you will need it below. In Settings, at the top, click the back-arrow three times to get back to the main Settings page. Scroll to the bottom and click System. Scroll down slowly to find the "USB Debugging" option, as shown below. Click the "USB Debugging" and click OK. The slider should turn green, as shown below. If you don't, you need to troubleshoot your networking before proceeding. If you see an error message saying "E: Could not get lock /var/lib/dpkg/lock-frontend - open (11: Resource temporarily unavailable)", restart your Kali machine. You should see a root shell on the Android device, with the Linux version information. Find the text covered by a green box in the image below.